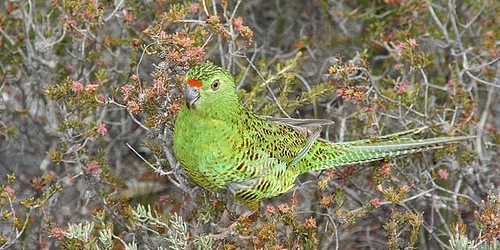 Is there still any Western Ground Parrot at Fitzgerald River National Park? Conservationists try to find out how many of Western Ground Parrots are still found at Fitzgerald River National. Unfortunately, expectation is not great because there has been no report of this species since 2010. Western Ground Parrot (Pezoporus wallicus flaviventris) is one of the most endangered parrots and there are only about 110 to 140 individuals left in the wild. However, this estimation might be strongly skewed because of its mysterious ecology and behaviour. As well as its close relatives Eastern Ground Parrot (Pezoropus wallicus wallicus) and Night Parrot (Pezoporus occidentalis) they are rarely seen during daylight but rather at dusk and early morning. This characteristic makes these parrots very difficult to find and count. Remaining populations persist at Cape Arid National Park and Fitzgerald River National Park. Unfortunately, at the latter site this species has not been recorded since 2010. With help of an action group Friends of the Western Ground Parrot researchers will try to rediscover this rare parrot again. Numbers of western ground parrots are tracked by recording whistles. “We go out about an hour before sunrise; we go to a particular location spread out 400 metres apart and leave Automated Recording Units (ARUs) in the field. My hope is to hear some calls and, better still, to see one,“ said David Taylor the chairman of Friends of the Western Ground Parrot for ABC news. Stand and sing Western Ground Parrot (Pezoporus flaviventris). (c) Brent Barrett. This file is licensed under the Creative Commons Attribution-Share Alike 2.0 Generic license (https://creativecommons.org/licenses/by-sa/2.0/deed.en). These parrots spend most of the day among low vegetation. That’s why there are so vulnerable to feral cats. Another serious danger are bushfires. Just four years ago, 30 birds died because of a fire at Cape Arid National Park. READ Sudden death of 14 critically endangered Orange-bellied Parrots at the Taroona breeding facility. Cause? Rats. Western ground parrots have been also kept in the Perth ZOO since 2014 to have a safety population. „We’ve got our fingers crossed that those in captivity at the zoo will breed. They have been showing signs, so something might come out of that,“ said David. Title photo: (c) Brent Barrett. This file is licensed under the Creative Commons Attribution-Share Alike 2.0 Generic license.